It’s a new month which means the blog counter gets reset. All is good though due to our recent trip out to Denver – came back with enough blog material to pretty much take me through the end of this year. That, of course, is under the assumption I can plow through the current backlog. Just need to get past a few more planned races and time should free up again. As of now I’ve managed to tweak a back rib which really luckily only hurts when I breathe or move. Making the best of a bad situation figured it would be a good time to sit in a chair and get started on the quota – holding my breath so if a long stream of letters shows up here get help for I’ve passed out. There are plenty of opportunities to still come away with some nice shots and if nothing else, you can use it as practice when conditions are not ideal out in the field. In a previous post it was mentioned that the Beast (my 200 to 400 glass) is capable of limiting the impact fences have on a shot as long as the subject you are shooting is a considerable distance away from the fence. You might get some linear shading but that can be worked out in the digital dark room if really needed – most of the time people will not notice unless your composition tells them there was a fence there in the first place. 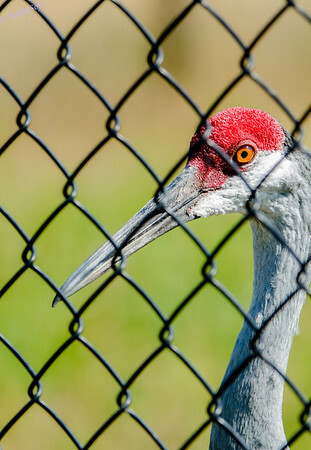 When the subject is close to the fence, there is no way the glass is going to let that go. Instead you have to be a little more creative. The easiest approach is to simply go for dramatic detail. 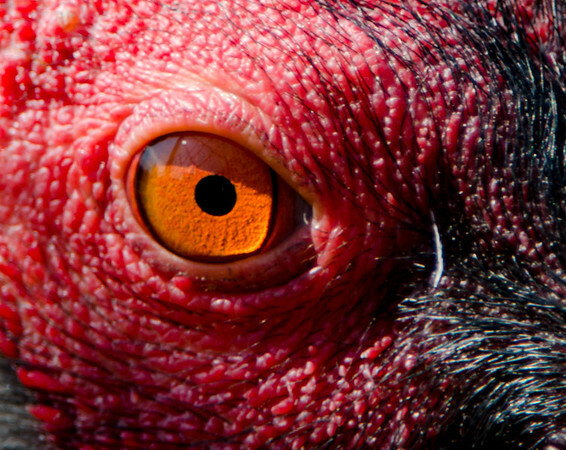 These first two shots were simply a matter of cropping out those pesky fence lines and focusing on the core component of all wildlife photography – the eye! If you recall, this topic has come up before (link here). I really like those shots and planning to make them into a mini wall collage at some point in honor of Peter Lik who does a similar thing with textures. Thanks to the ICF trip there are now two more shots for the collection. Hit the jump to see more examples of how to cope with fences in your composition! The key to the shot is… that’s right, timing. You need to maintain focus on the eye and anticipate when it is going to be centered between the wires. I mentioned that this is good practice for the field since you have to maintain focus on the eye and not let the focus point drift through a wire – otherwise your glass with start to travel. Note, keep it on auto-focus for maximum practice. This will force you to stay steady with the glass and if you do lose it, force you to quickly find it before it crosses the next link. No different than trying to get a crisp shot of a bird sitting in a leafy tree on a windy day. The full second shot shows some of the compensation you get when the subject is a little further from the fence – Notice the dimmer shading – those dim proportionally the further the subject is from the fence to the point it isn’t really noticeable – if it is.. crop it out! On contrast, the Crane below is much closer so hardly any dim factor. No worries.. crop it out! Since the camera is a two way art, maybe the subject is the one on the outside and the audience is the unfortunate ones behind the fence! Could be a hardened criminal Crane that needs to pay for injustices to their fellow Crane society. The media has been demonstrating for years that the photographer gets to tell whatever story they want to (and the sheeple will believe). I did work up a number of different examples of compositions as a starter set for the next time you might be at a zoo or some other form refuge with man made habitats. 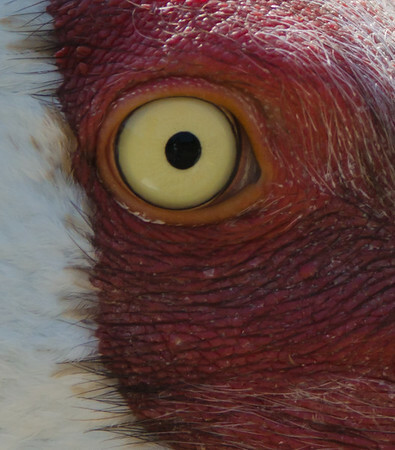 The following shot was pretty interesting due to the symmetry of the geometries – the angle of the crane head and neck reflect the upper angles formed by the links and the eye kind complements the small gaps where the links come together. Changing your orientation slightly (less perpendicular to the fence plane), you can add some depth to the shot. Would have preferred to press the trigger a fraction of a second earlier to get the eye centered better. Can even get a completely different feel by having the subject be perpendicular to the fence plane. Now this gets a little more difficult getting the shot since you need to really get BOTH eyes centered relative to the composition of the fence. Definitely harder to do but nothing of value comes without doing some work. 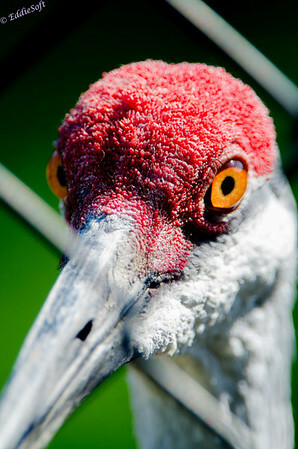 For the record, I’ve always thought these long billed birds look downright mean when taken straight on. Took solace in knowing that fence was there otherwise it would probably be making me its errr let’s go with making me cry Uncle instead of my usual reference hehehe. So next time you are forced to deal with an annoying element in your viewfinder – step back and see what you can make of it. If nothing else, you can take back a level of detail you might not always get a chance to see. 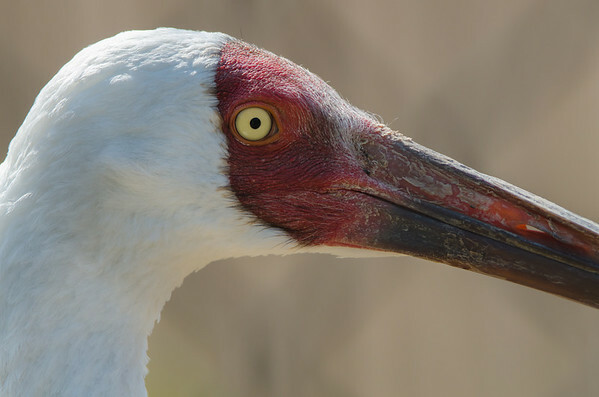 So it isn’t wall hanging worthy, you can still visualize what the head of a Crane really looks like, what textures does it possess, how fragile or how tough of a beak does it possess. All things that add to the overall experience. Take for example the shot below. 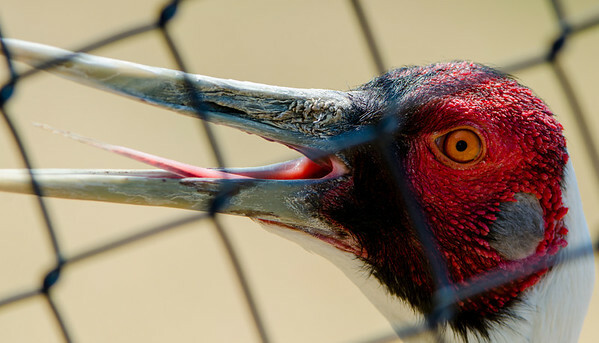 Not going on my wall, but happy to put it on my blog so all my viewers can experience what a Crane’s tongue looks like. Detail that doesn’t come when it is hanging out at the back of the pen. Hope you enjoyed this experiment with putting round shapes in square holes. Regardless, I got plenty of training which surely helped while walking the Denver woods! This is an excellent blog post on a real problem. 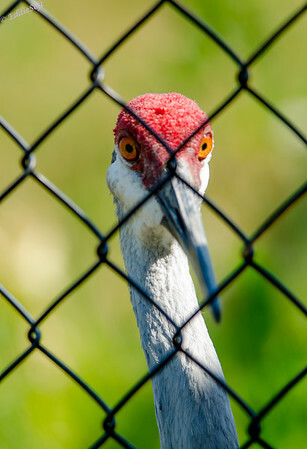 I don’t recall reading tips about dealing with chain-link fences before, but it’s always a pain in zoos and elsewhere. 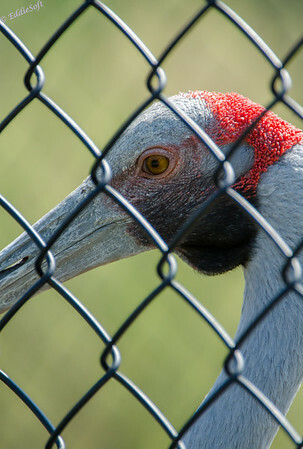 I can’t believe the International Crane Foundation won’t find a more camera-friendly means of containing the Cranes. 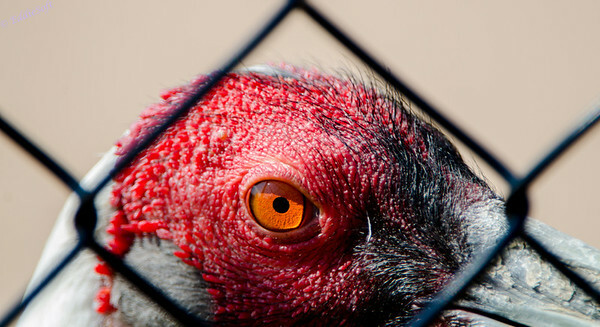 I mean, the birds are a whole lot bigger than the openings in a chain-link fence, so why not have larger openings? Maybe with thin, black cables so they disappear easier on “film”. They depend on bird lovers for their money, and they should make it easier for them to take good pictures. That will be some crazy mini-wall-mural made up of bird eyes. Don’t hang it over your bed or you’ll have nightmares. I have an idea for Linda: I would edit one or two of the images to move the pupil to the other side and occasionally switch that picture in the mural to see if you notice the eyes moving about. But Linda is probably too impressed by your attempt to honor Peter Lik to think up evil things like that. Thanks for the photos and tips! Before you go off on them too much, they do have a few habitats that are wonderful for photographers – we took full advantage of those, but they have a circular pen in the middle of the grounds that has a wooden pen at the center to allow them to get inside out out of the elements if they want and then their pen is essentially a pie wedge out from that (like a trivia pursuit player piece). That is where the fence is but I could see them making the links a little further apart unless that produces a choking concern – our local zoo lost a baby giraffe that hung himself between a V in a tree (very sad) – wouldn’t want one of these creatures to stick its head through and then not know how to turn the beak to get it to free itself (or have its mate off him). I probably won’t put the eye mural near my bed especially the grizzly one – have enough trouble getting to sleep without the thought of being dinner. Don’t be giving Linda any ideas. Next thing you know they will be replaces by clown noses or something equally horrifying. Wait, what am I saying, there is nothing more horrifying than that. For the record, not really honoring the Lik.. more like embracing, extending and bettering – yeah, that’s it.